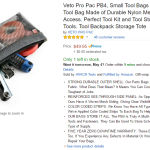 You are here: Home > Veto Pro Pac PB4, Small Tool Bags and Tool Tote 4 Pack? Reviews are funny…. Veto Pro Pac PB4, Small Tool Bags and Tool Tote 4 Pack? Reviews are funny…. Klein Tools 5139 is 12.5″ x 7″ x 1″ I really like this size…. I have a couple different brands like this one. Klein Tools 5539CPAK 3 Pack is 10″ x 8″ x 3.5″ The opening is too small…. but the zipper is very nice. (My hand might be too big?) The grommet is also nice…. to attach to items…. which also causes the problems with the opening. I will purchase almost any bag…. and I love my Veto real tool bags. But really mesh…. is it 1980? Also a plastic side! Is this a tool bag or what? Also the reviews on amazon! I really rather see no reviews then housewives reviewing tool bags. LOL 🙂 That is actually why I did not purchase the 1980 throwback bags. Sure I use one of my colorful weird Klein Tool bags as a compact flash drive case in my office (nerd stuff bag). But these Klein bags are pretty worthless when you are doing manly things! LOL 🙂 Plus I do not need a $10 Veto pencil case…. unless “I receive the product at a discount to write an honest, unbiased review.” LOL 🙂 Search “discount” in the reviews…. 23/ 48 reviews got a discount. Just saying. 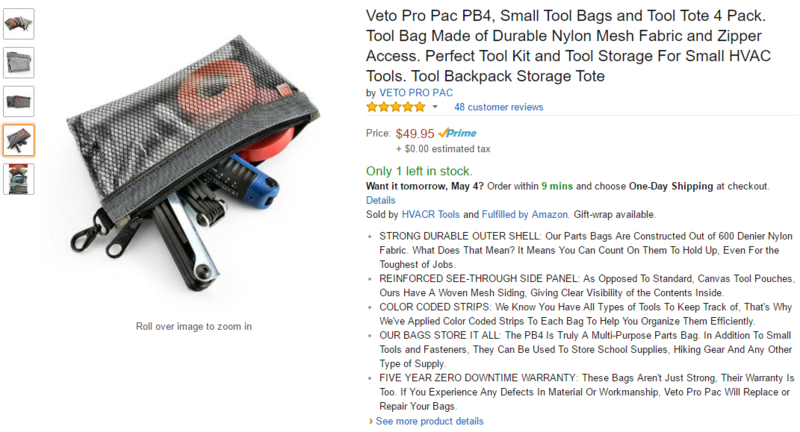 Another New Veto Pro Pac Bag that I saw…. Was the Veto CP4 Grubber Cargo Pac Tool Bag.